"I wanted to see what would happen when I put two or more quatrefoil blocks together...but I didn't have enough time to make an entire quilt. So, today's project is a simple table runner. 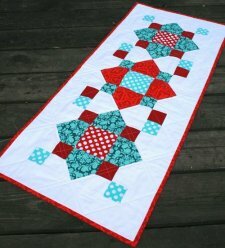 While I'd still like to use this block in a quilt, I like the simple pattern made by the three flowers together." What do you think of this table runner?